Beaufort South Carolina attractions include the southern plantation homes in the Historic District of Beaufort SC. A tour called The Spirit of Old Beaufort will take you on a journey through this old town and its history. Evelene Stevenson is the owner-operator of The Spirit of Old Beaufort Tour Center. The Spirit of Old Beaufort Tour had been highly recommended to us by friends when we made our first visit to this coastal community and the Tour of Beaufort lived up to our expectations! We saw historic southern plantation houses that were not offered on other Tours of Beaufort SC. With Evelene as our personal guide, we were constantly entertained and educated about the City of Beaufort and its former residents. When it comes to things to do and attractions in South Carolina, this one is ranked high if you enjoy history. We strolled along the downtown streets and were given inside information about the families that used to live in these beautiful old southern plantation homes. I can now tell you which Beaufort SC residents hosted the most expensive parties and which former citizens were considered traitors by the community of Beaufort County SC. It was certainly a unique event to trail along behind Evelene who was in costumed and held the groups attention with her many interesting stories about the Old South and the southern plantation homes. It added a lot of appeal to the tour to experience the Tour of Beaufort with this lady dressed in a costume of a bygone era. Others also make appearances dressed in full costume including a hoop skirt gown. This made the walk so much more enjoyable because it added an authenticity and element of fun at the same time. When you combine this with the sight of horse drawn carriages, it was easy to get caught up in a little time warp. As we traveled from stop to stop, we got to look at the pictures that Evelene brought along to share. These photos gave us faces to put with the names and the historic southern plantation houses. There was certainly not any dull moments in this tour. We were encouraged to ask questions anytime we liked, and it seems as though Evelene knows as much about this city as if she had lived there personally for 300 years. This was much better than just listening to the rehearsed patter of usual tour guides like at most South Carolina attractions. She was able to make Beaufort County SC history real and exciting, which can be a difficult thing for many people to accomplish. 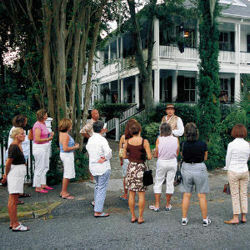 The Spirit of Old Beaufort can accommodate tours for any number of individuals. For large groups there are some bonuses. 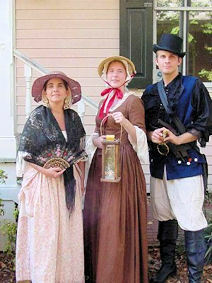 There is a special program called "Echoes from Beaufort's Past" that is performed by several people who are dressed in authentic period outfits. Reservations - Required to confirm a time. Walk-In welcomed but will go on next available tour. They entertain the audience with a variety of dancing, singing, and acting performances. You can discover what southern ladies meant when they moved their fans a certain way, and participate in some authentic dances of the era like the Virginia reel or the Pattycake. This show was a highlight of the tour. Unique attractions in South Carolina wont get any better than this one! I hope you enjoy The Spirit of Old Beaufort and the Tour of the Historic Southern Plantation Homes as much as we did. 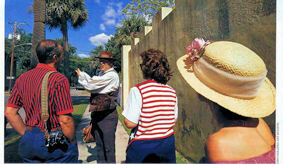 The Spirit of Old Beaufort has many tours to pick from and in our opinion you will enjoy them all!